A delightfully unexpected highlight of Adrienne Zihlman's wide-ranging career was opening her lab to a team of animators who were researching gorilla anatomy for the film Tarzan. Adrienne Zihlman has been interested in "looking inside things" ever since she was a little girl, watching her grandmother butcher chickens on the Iowa farm where she spent summers. That fascination propelled Zihlman's career as a physical anthropologist, during which she plumbed the depths of modern ape anatomy for clues to human evolution. 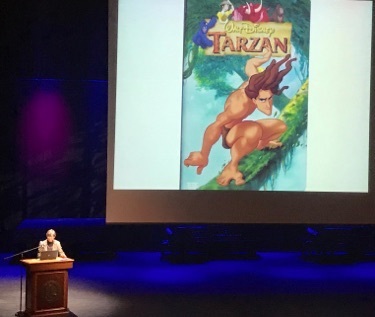 Now a distinguished professor emerita of anthropology, Zihlman delivered the 29th annual Emeriti Faculty Research Lecture, "The Inside Story of the Apes," to a capacity crowd in the Music Center Recital Hall on November 13. Zihlman regaled the audience with tales of the meticulous dissection of Bwana, a beloved male silverback gorilla who had delighted visitors to the San Francisco Zoo for decades. She told of her collaborations with renowned chimpanzee researcher Jane Goodall. And she wrapped up with an anecdote about the day a crew of 15 animators from Walt Disney Studios immersed themselves in her lab, riveted by the workings of the tendons of a gorilla's hand, as part of their preparation for the film Tarzan. Driven always by curiosity, Zihlman expressed gratitude for the diversity of opportunities and experiences she's had at UCSC: "You just don't know where basic research is going to take you," she said. Zihlman's pioneering work on comparative anatomy has yielded paradigm-changing insights about locomotion and the search for the common ape-human ancestor. She joined the Anthropology Department in 1967, becoming one of very few women faculty members at the time. Initially working on fossils and bones, she ultimately became fascinated by what modern ape anatomy might reveal about the past. She turned her attention to the whole body—the skin, muscles, and bones—of gibbons, orangutans, gorillas, and chimpanzees, all of which are threatened or endangered. Zihlman worked without a proper lab for 27 years. "They built me a large black table, gave me a freezer and some scalpel blades, and I was good to go," she recalled. In 1994, with the opening of Social Sciences I, the Anthropology Department finally got state-of-the-art labs, complete with a walk-in freezer and a freight elevator. "I had a secret desire to have a large silverback gorilla in my future," Zihlman said of the elevator, which she lobbied for during the building-design process. Six months later, her dream was fulfilled when she was honored by the opportunity to study the remains of Bwana, the 385-pound gorilla from the SF Zoo. "It was a real team effort," Zihlman recalled, showing slides of her lab crowded with UC Santa Cruz undergraduates, Cabrillo College students, photographers, and her collaborators Robin McFarland and Carol Underwood. The analysis is painstakingly detailed. "We weigh and measure everything," said Zihlman, who studies body proportions and composition within and across species, as well as differences between the sexes. She compares the mass of the upper and lower body, the forelimbs and hindlimbs. She studies the muscles of the hand, the structures of the foot, joints, and tendons. Nothing goes undocumented. Zihlman's careful study of two species of chimpanzees, Pan paniscus and Pan troglodytes, yielded revelations about their different body proportions, as well as differences between males and females. "Everybody loves chimpanzees," said Zihlman, who pointed out the ways in which they have "broadened" ape characteristics: feeding on the ground as well as in trees, traveling further than their ape relatives, being bipedal, and manipulating materials, leading to tool use. Chimps fashion and use spears to stab animals and "wands" to "fish" for termites. "The females are more adept tool users, and infants learn from watching their mothers," noted Zihlman, who has augmented her lab work with extensive time spent observing animals in the field. Chimps are also different from humans—although our shared common ancestor had anatomy something like a chimpanzee, she said. Zihlman hypothesizes that the success of bipedalism 3 to 4 million years ago sped up evolution among 10 or more species, ultimately leading to Homo sapiens, with less overall muscle, more skin and fat, and flatter feet on which to walk. Still active in research, Zihlman thanked the students, colleagues, collaborators, vets, and zoo personnel who have been her partners over the years. Mainly, however, she is thankful for "the apes who've helped us understand ourselves."